For the first time, an official delegate from the Delaware Tribe of Indians, Bartlesville, Okla., visited the site of Greentown, where tribal ancestors lived more than 200 years ago. Michael Pace and his wife, Ella, participated in a special ceremony commemorating the bicentennial of the burning of the Indian village near Perrysville during the War of 1812. 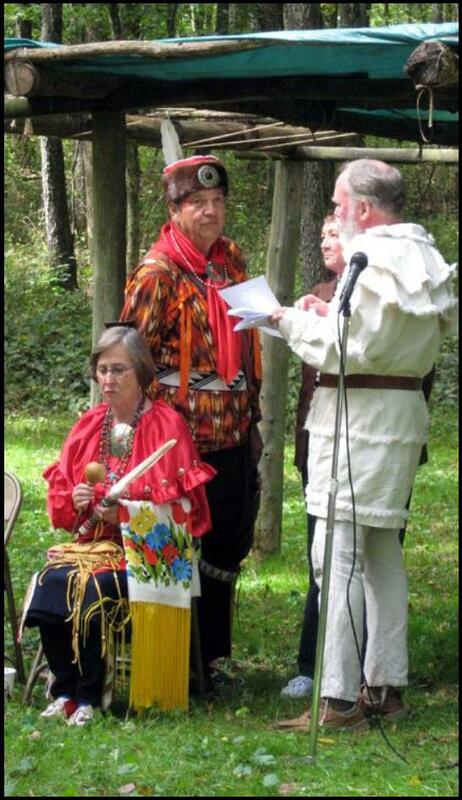 Dressed in Delaware regalia, he spoke on behalf of the tribe and presented a traditional drumming, inviting everyone to participate in a social dance circle. 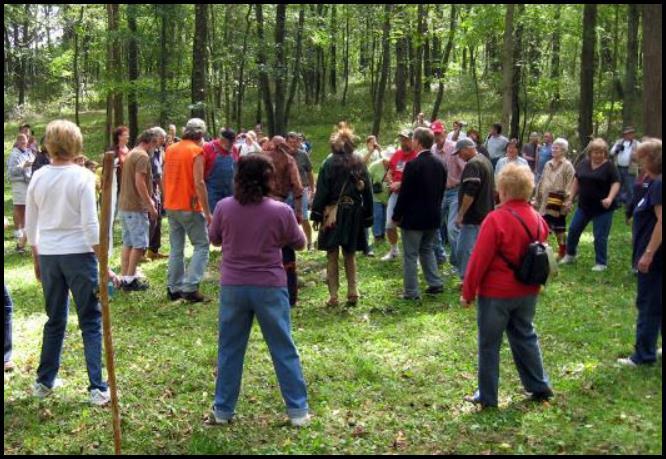 While the ceremony noted that people were displaced and killed on the Ohio frontier in the war that involved the British, American militia, settlers and Indians, it also emphasized forgiveness. But Pace added that the Delaware do not forget and must fight for their place in America every day. An oval leather ball filled with pine needles was made by Greentown’s living history interpretation director Doc Shaffer. Two poles were set up on either side of the playing field, about 150 feet long. 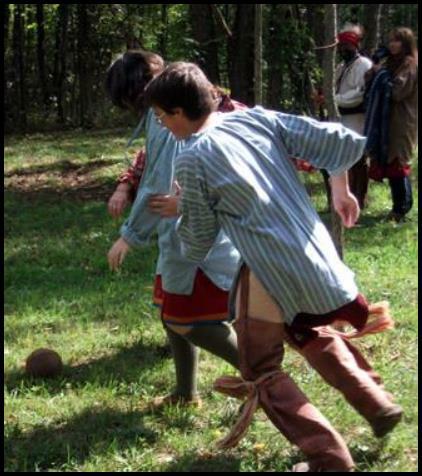 Traditionally in this game, men are only allowed to kick the ball down the field — not touch it. Women may either kick the ball or pick it up, throw it or carry it. The women also may grab or tackle men players, but the men may not touch the women. Men may intercept a thrown ball but must proceed by kicking. Both teams may have as many on the field as they wish. Both older children and adults play together. On this day, the women won, reportedly using another old trick — giving the ball to an elder and surrounding her as she walked through the poles. Nevertheless, a good time was had by all. 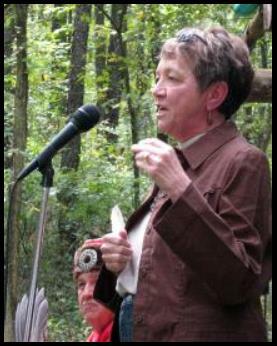 A special guest at the 2012 Greentown Gathering was Bobbi Harpster of Ashland, whose ancestor was the Rev. James Copus, a friend to the Greentown Indians but who was killed in the aftermath of the burning of the village. 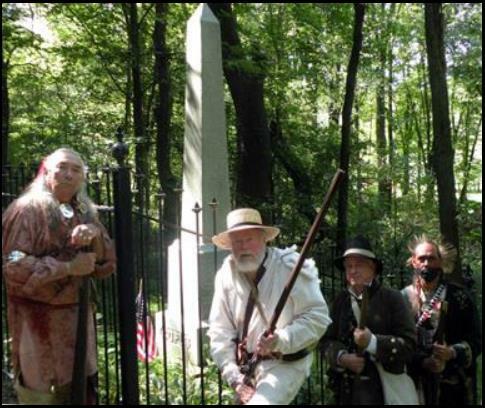 Roger Moore, Bill Jones, Doc Shaffer and Jeremy Moore pose at the marker commemorating the destruction and violence in and around Greentown during the War of 1812.